In our last post, we reviewed three reusable pod coffee maker capsules for your Nespresso machine. But is it worth another $50 to buy an accessory to your coffee maker when the pods work just fine? Here’s a simple breakdown of why DIY coffee capsules are the best option on virtually every level. One original capsule contains less than ¼ oz of coffee; do the math and you’ll find you can easily spend upwards of $50/lb this way. Further, reusable coffee capsules give the consumer the ultimate choice of which coffee they prefer to use and can afford. 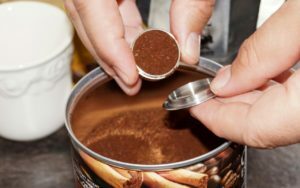 Every single-use coffee capsule creates garbage. Aluminum is a valuable resource produced with intensive energy investment at the cost of great environmental destruction. It can be recycled in part, but that also requires a lot of energy. Each capsule is less than 1/10 oz of aluminum, but consider the impact multiplied over millions of single-use servings. 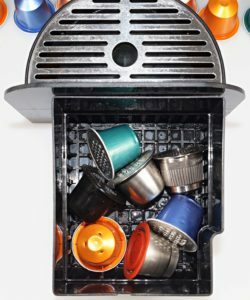 A reusable pod coffee maker capsule saves one pound of aluminum for every 230 cups of coffee brewed; on the large scale, we are talking of millions of tons of aluminum waste that could be prevented! Conventional coffee production often causes environmental issues in the lands where it’s grown, either through pesticide use or monoculture farming methods. While they may try to confuse consumers with their own “sustainable quality” labels, the branded coffee in single-use capsules is neither fair trade nor organic. Is it because that would be too expensive? As we mentioned above, single-use capsule coffee regularly prices at over $50/lb; you can score a decent organic fair trade coffee for around $12/lb – less than 1/3 of the price. Ironically, the cheapest option is in fact the most sustainable – buy a reusable capsule set and “upgrade” to organic free trade beans and still save yourself hundreds of dollars per year. Nespresso announced its intentions to purchase fair trade coffee in 2013, but continues to purchase such a small percentage of its beans from fair trade sources that it has yet to be certified four years later. This is unfortunate, but a reusable capsule makes their corporate failure irrelevant: You can purchase the fair trade, organic, GEPA-certified, or third wave coffee of your choice and refill your own capsules. Basta! Reusable pod coffee maker capsules, such as those we reviewed from Mycoffeestar, Mister Barista, or Coffeeduck, cost between $9-45, which some consumers find expensive. The companies selling these capsules have worked hard to get us thinking of each cup individually, priced around 60 cents, so that it sounds inexpensive. But the math on this isn’t complicated. One pound of organic fair trade coffee costs $12. The reusable capsule from Mycoffeestar costs $46. So, the first pound of coffee drinking with a reusable filter costs less than $60. How many coffee pods would one get for this same $60? It takes 75 pods to equal the same pound of coffee; at a low 40 cents per pod (assuming sale pricing), it takes just two pounds of coffee to amortize the cost of the most expensive reusable filter we reviewed. From there on out, it’s only savings in your pocket. Single-serve users continue to buy outrageously priced, unsustainable coffee, while those who fill their own reusable cups save anywhere from $30-40 per pound every pound, depending on the type of coffee purchased, helping the environment with every cup. In short: The cheapest choice is also the most sustainable one – and that’s the easiest kind of change for any of us to make!